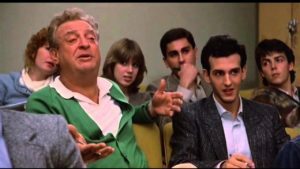 If your over 40 I am sure you have seen the movie starring Rodney Dangerfield called “Back to School”. In the film, Dangerfield plays Thornton Melon a self-made millionaire who decides to ‘enroll’ at his sons’ university. I love this film and the humor of Dangerfield but the nuanced humor of the ever man dropped into the “snobby university” with the elitist (complete with British accent) professor who looks down his nose on the crude street hustler. The picture above is of Melon in an Economics class schooling a professor on how real startups are done. Take note of the kids in the back….hungry business majors hanging on every word of the man who actually has done it (ignoring the degreed instructor in the front) as if every word were manna from heaven. We live in a world in transition where traditional education is morphing and struggling to meet the demands of an economy changing by the second. An entire industry and generation of educators is under assault as the product they are producing (college students) are burdened with debt and the reality that the idea they were sold of a degree guaranteeing them success in life. In addition, the educational system is staffed from top to bottom with “institutionalized” professionals whose very livelihood is dependent on defending the system failing to produce results. The reality is and always will be that school in all it forms and levels is ill-equipped to completely educate. And each and every attempt to do so fails. Think about this…there are university programs now teaching “entrepreneurship” largely taught be people who have never been entrepreneurs. Something very wrong about that don’t you think? With the onset of technology, education is available to everyone….the degree is not a ticket because in the real world…..Merit and Outcomes Matter the most.